Everything but the goal.. | Through the seasons before us.. The moment that should have won us the game.. This is the third time I’ve used this headline – but it fits so well. I’m sorry, it’s late. Well, when I predicted a stern test from one of the likely ‘there or thereabouts’ teams come the end of the season I couldn’t have been more wrong, could I? It turns out that Blackburn came and offered very little threat to the Reds who dominated the game but were unable to create enough tangible efforts on goal. Those efforts we did have were spurned. However, it’s funny how 90 minutes changes your perspective isn’t it? At kick off I might have been tempted to take a draw if offered – but certainly I’m sure the gaffer and the players, like me, will feel disappointed not to have snagged all three points against a particularly unambitious visiting side. With suspensions playing havoc with our attacking line it wasn’t too surprising to see Sharp up top on his own, with Lansbury earning a start in midfield, leaving space on the bench for Jermaine Jenas to eventually get the chance to make his second debut for the Reds. It was sort of like that. Kinda. You know what our midfielders are like, they’re all over the place! Having been made to swap ends, Forest started brightly, an early corner evaded Ayala and Cohen early doors. McGugan crossed from the right to Sharp, but he couldn’t muster any power for this shot which ended up an easy save. The visitors had their moments too, a shot from outside the area from Hanley needed dealing with by Camp but it was a routine stop. But really it was a fairly pensive half of little chances – Blackburn pressed really far forward to try to stop us playing from the back, we just as stubbornly carried on trying to do so, which was risky. As the half drew to a close we had a bit of a pinball session with a number of efforts flying in towards the Blackburn goal, but ultimately after a combination of saves and blocks we ended up with the ball in the Trent End after a particularly ambitious volley from McGugan. So half time and to be honest, it hadn’t been the most gripping of halves – but we’d certainly more than matched our opponents, which was good! The first action of the second saw Reid fire just over after a corner hadn’t been cleared particularly well, and we resumed the battle of wills to try to break one another down – with Blackburn increasingly content to allow the Reds possession in their own half. On a rare foray forward Jordan Rhodes tried to buy a penalty with an unconvincing collapse whilst stood near Chris Cohen. Fortunately the referee – who had been ridiculously lenient all game – didn’t give the spot kick. He also didn’t book Rhodes for the dive (in fact, he didn’t book anyone all game). Lansbury had had a few wayward moments after some nice touches in the first half, but showed a moment of real class when he controlled the ball whilst taking it round his man to give him space to shoot in the area. His left footed strike was decent enough but saved well by Robinson in the visitors’ goal. It was Lansbury who was withdrawn shortly after for Majewski who was immediately eagerly bustling around the place. He made a lovely jinking run along the bye-line, tricking his way past Olsson before putting a dangerous ball right into the six-yard box, sadly no Red shirts were close enough and Orr was able to get it clear. The real chance of the game though came to Billy Sharp. A lovely clipped ball from Reidy found the striker in the channel, he did everything right with his first touch to control the ball and tee himself up with a chance to shoot from close range and… missed and hit the side-netting! Gutted doesn’t come close! It was just the kind of chance you’d expect him to score. I’m sure he’s thinking that himself, too. There’s not much point in labouring the point! Jenas was introduced with just over seventy minutes gone to replace Lewis, he had a few nice touches but sat quite deep for the most part. Blackburn by this point had all but given up trying to get forward as the Reds enjoyed a lot of possession whilst trying to find a way through the away side. Coppinger was the final change near the end for Reid, but despite enjoying possession and territory we weren’t really able to mount anything approximating a decent chance in the closing stages, which was a little frustrating. Definitely a game where we could and ought to have done better and given Robinson to do. Though as Robin Chipperfield pointed out on the radio on the way home, had Sharp bagged his chance (or Lansbury, for that matter), the tone of this report would be very different and we’d be celebrating a decent performance and three points. It was still a decent performance – and it’s good to be able to say that having looked like we were on somewhat of a downward trajectory in recent games. Oh, should show some respect for the Rovers defender who got up after being full on booted in the face (accidentally, I might add!) by Ayala in a penalty area scramble following a corner. It looked nasty from where I was sat so I was glad to see he was okay following the incident! Much better performance, nice to see the ball on the deck again and we looked solid at the back dont think it will be long now till we see the score line improving. To the Boo boys, you paid good money so a bit of encouragement would be nice as for the ref he wants to know if anyone has found 2 cards, thinks they may be in the car park. Really pleased to see us playing football again after the Derby mess. 10 goals in 9 games though: that’s Cotterill form. Gutted for Billy missing that chance – hopefully he’ll get one against Peterborough and then they’ll start coming thick and fast. It might be my imagination but we seem to play better football with one up front, only we don’t have enough firepower to make it count. When we go 4-4-2, our rather slow midfield loses control and we start belting it long. I’m sure Sean will sort it out anyway. Much, much better last night – just a shame not to have any goals to show for it. Would have taken a point beforehand, following the previous two games/performances. Looked well organised throughout and the match stats showed how much of the play we had. Although they did perhaps come for a point, there was always a danger of a break (in the first half at least). Did a good job of nullifying Rhodes, even if the penalty shout was a close call! Obviously we still need to translate this possession into creating and (more importantly) taking chances in front of goal, but on a positive note, at least we survived 90 minutes without any bookings. No idea what that ripple of boos was all about – get a grip. I can understand the boos. Yes it is early days but lying in 17th spot & 10 pts adrift of an automatic promotion spot is not encouraging form. We seem to have assembled a talented squad but it’s not translating to points as yet. Reports on so many games over the last few seasons say Forest were dominant but couldn’t land the killer blow. So I guess there will be a portion of fans who would be frustrated by another game where 3 points have gone begging. I don’t understand the boos either. Sure, its disappointing not to win a game we pretty much dominated throughout but you can’t say it was due to any lack of effort by any member of the team. Surely the thing to do is cheer and applaud to encourage the team??? If Blackburn are one of the promotion favourites I don’t think we have a lot to worry about. Their strike force looked distinctly tame against a well marshalled defence. Thought the back four were excellent and for me, probably Halford’s best 90 minutes in a Forest shirt. I quite like the long throw option as it gives any defence something else to think about. 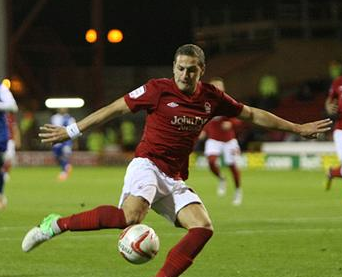 Was good to see Radi get some time on the pitch. He undoubtedly made quite an impact and maybe that’s his best role – as an impact sub as he certainly seems to often fade out of games over 90 minutes. Cohen, although not back to his sharpest, is showing what an incredible athlete is really is. After 12 months out. lasting for 180 minutes over 2 games in 4 days? Incredible.